Oat beta glucan has been shown to lower blood cholesterol. High cholesterol is a risk factor in the development of coronary heart disease. Coronary heart disease has multiple risk factors and altering one of these risk factors may or may not have a beneficial effect. - Protein contributes to the growth and maintenance of muscle mass. For over 140 years, the Quaker Oats family has been inspired to produce delicious, nourishing breakfasts. Quaker Rolled Oats are our oats in their purest form. Cut, kilned and rolled to the same thickness, and with no artificial colours, flavours or preservatives; our wholegrain oats maintain the delicious taste you would only expect from Quaker. Our porridge sachets come in a variety of natural flavours and are ready to eat in 2 minutes. By Appointment to Her Majesty the Queen Suppliers of Quaker Food Products. Quaker Oats, Royal County of Berkshire. Oat beta-glucan 2.5g per 100g. 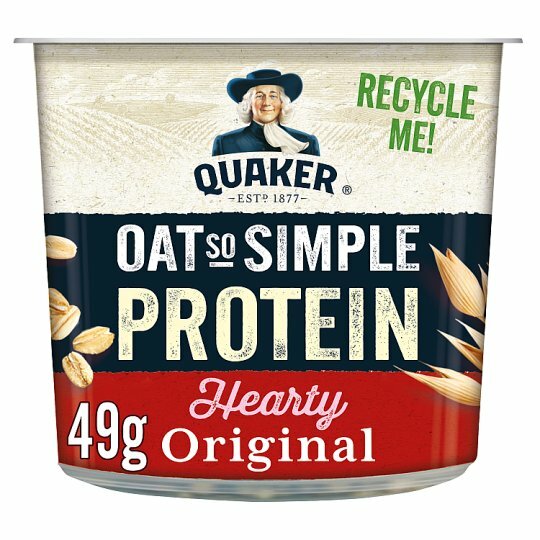 Each serving (49g) contains 42% of the 3g of oat beta-glucan suggested per day.